Concert dance performance is a tricky beast. Dance productions tend to use recordings. 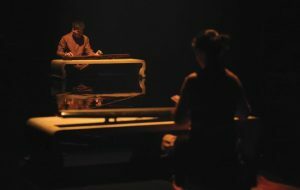 If live musicians are present, they tend to be either peripheral, or fully incorporated into the scenography as physical performers in their own right. One Infinity is a bit of both, and is consequently uneven; enjoyable but flawed. Director Gideon Obarzanek positions us in two opposite seating banks surrounding a rectangular strip running left to right. Five musicians are located at the edges of the strip. Dancers (from Beijing Dance Theatre and Dancenorth Australia) only enter the central area twice for what are the most successful sections, with the dancers and instrumentalists literally sharing the space. Otherwise the dancers are located in the seating banks, with a key dancer whom audiences are encouraged to physically echo being seated at the very top. The main group of dancers are however two levels down from this. It is therefore not possible to focus on any of the numerous elements within One Infinity. When each audience group joins the elevated performer in weaving our arms within fairly simple movements, the idea seems to be to just “go with the flow” within a dispersed and encompassing vision. The relationships between the live instrumentalists, electronic musical interludes, and the dance however vary from the banal to the opaque. 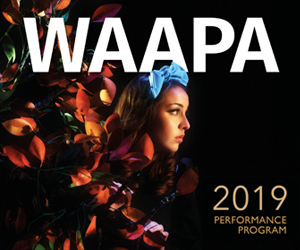 The problem may lie in the musical composition by Max de Wardener and Genevieve Lacey. 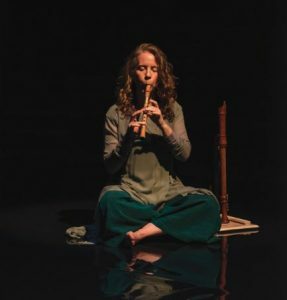 Lacey is a breath-takingly subtle recorder virtuoso. Here she performs opposite four Chinese classical musicians from the Jun Tian Fang music ensemble. Three play a rarefied form of horizontal unbridged Chinese harp or zither, the guqin (Wang Peng, Zhuo Ran, Zhang Lu), and a fourth is on bamboo flute (Xiao Gang). Peng is the guqin master who trained Ran and Lu. He performs two exquisite solos which showcase classical modes of string bending, sharp and light attacks, and so on. His acolytes perform one additional solo each. Ran plays like a slap bass guitarist, his contribution pushing the instrument into harder, more extreme outcomes. Lu by contrast has a slightly differently tuned instrument, her notes having a beautifully microtonally frayed edge, each tending to hang and resonate into vibrating fractures. While these younger performers do indeed also play with Lacey, their more striking solos rest largely outside of the larger structure. The electronic elements, verging into noise at times, feel like they come from a different composition. There is some cross-fertilization as Lacey’s extraordinary, heavy and wooden sounding bass recorder echoes (and may have been sampled) within the electronic accompaniment, but the music by and large exists as discrete blocks. Obarzanek consequently struggles to provide a substantive choreographic dramaturgy. The section on the floor where the dancers begin by shaking, bouncing, then sawing at the space as though swimming, finally breaking out of lines and across the strip, is the most interesting and the only section where one can actually watch the dancers while also observing the extraordinary musicians. The rest of the choreography however reinvents some of the oldest clichés about Oriental and/or mystical movement. Dancers are seated behind each other with arms intertwined like Hindu gods, or fold in and out around a central point like a blossoming rose. It is attractive enough, and Obarzanek wants it simple, but it is frankly unexciting and does not compare to other instances of similar choreography by say Akram Khan let alone experts in Indian classical dance. It is perhaps significant that Obarzanek uses the mandala as his inspiration, a spiritual visual motif associated principally with Buddhism and especially its Tibetan mystical forms. The guqin however has traditionally been associated with the Confucian/Daoist scholarly class of the Chinese Imperial court and was originally not even intended for performance, rather being a personal form of meditation and contemplation. It is therefore not surprising that this kind of music, which calls for extremely focused attention in the listener, does not blend well with the more visually florid motifs of the mandala. One Infinity is therefore a curate’s egg. The guqin performances are quite simply jaw-dropping as well as being very modern in expression despite the long classical tradition to which Peng and his students are heir. I would moreover happily go again to hear Lacey’s beautiful, spiralling recorder. Parts of the choreography are strong, and the audience interaction is well handled. But the question of what this show actually is has not been fully addressed. Is it a concert, in which the dance functions as marginalia? Is it a show about audience participation and immersion? Is it a meditative choreographic experience in which the music functions as the accompaniment but not focus (this seems closest to the end result)? Or is it something else again? One Infinity includes superb elements, but it does not gel. One Infinity continues until February 10.